DuPage Angler Lands Pond Bronze! I've been catching some nice fish during my vacation this week. Thursday morning I head down towards a section of the Fox to scout out some possible wading spots and a couple of creeks. As I take notes and pictures, I also notice there are small pounds along the creeks. Thinking back to the flood and amount of water that went through the area a couple of months back, I couldn't help but wonder if anything form the river had gotten into these ponds. After a few of 12" and 13" LMB from throwing a Crabby Bass Whacker under some over hang trees, over a log, and along a weed patch. Running short on time, I decide to cover the wind blown side of the larger pond with a BPS Egg since I can cast past the middle of it. After ripping some weeds and 1 LMB, I made a cast to the dead center of the pond and retrieved. I was feeling a few bumps along what felt like weeds when the Egg got slammed! I set the hook and felt the jolt of energy and it leaps out of the water. It's a TANK smallie! After a few minutes of fight, I have it near the muddy shore and I am now holding a 20" long smallmouth with a 12.25" girth and probably weighing just under 4lb. WOW! I bet that almost 4 lb smallie fought like an 8 lb largemouth! Congrats on the tank and the COTD! I was surprised to pull this out of that pond I thought it was a huge largemouth at first! I think it either got in there during the flood or someone tossed it in since it's only 150ft from the river. 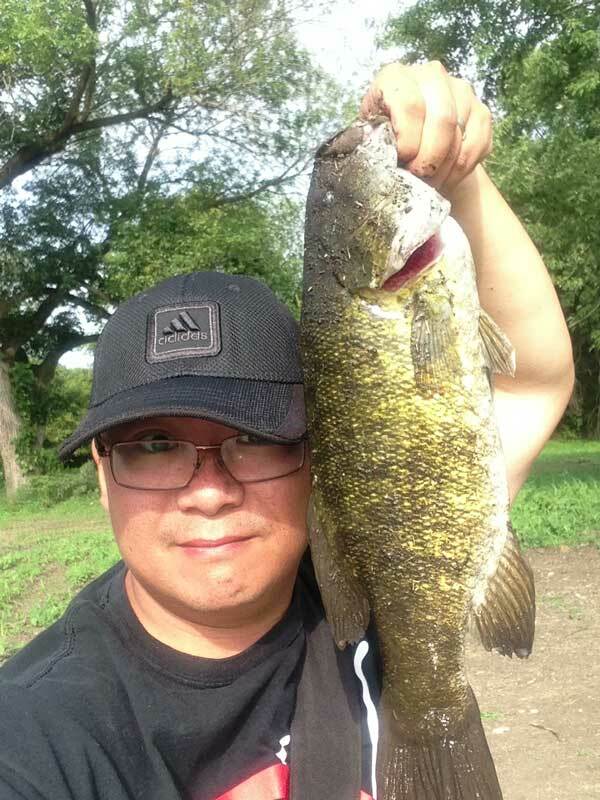 Awesome smallie, and you're even wearing your DA Shirt, must of known you'd get a COTD. The EGG strikes again! GIANT smallie! What a week for smallmouth you are having!!! That is so cool. What a week you are having! Great job JC, what a fish! That is what Mark Zona would call a "Smallasaurus" or "Bassquatch"! That beast looks like he fought big time! Way to go!